When we ventured out to hike to the Bigfoot Trap we didn't ask any of our local friends for directions, we just decided to go it on our own alone and ended up on a wild goose chase or "wild Bigfoot chase" if you will. ðŸ˜‰ We followed some vague directions online and went with the description that said it was directly across the entrance from Hart-Tish Park where we go to swim at Applegate Lake. So we parked by the Collings-Mountain trailhead and walked back to Grouse Loop Trail. It ended up being a fantastic day for hiking so we didn't complain too much. It gave us an absolutely stunning view of Applegate Lake but no Bigfoot Trap. If you want to get the view of Applegate Lake without the full hike take a right instead of a left at the fence and about 1/4 mile up the trail, turn around and you will catch a breathtaking view of the Applegate. It was too cold take a dip when were there in the spring but we will be for sure heading up in July when the water starts warming up and hit up some of our favorite tributaries! Anyway's, once we got back to the car we ate our lunch and I walked around to explore the Collings Mountain Trail sign a little closer and whaddya know there was a tiny bigfoot footprint on the sign. Who knew?! So, we finished up our lunch (which happened to be the awesome Pennington Farms chili relleno, and spinach-mushroom turnovers that you MUST try) and we headed out on the trail. The hike down into the canyon is absolutely gorgeous and enchanting. 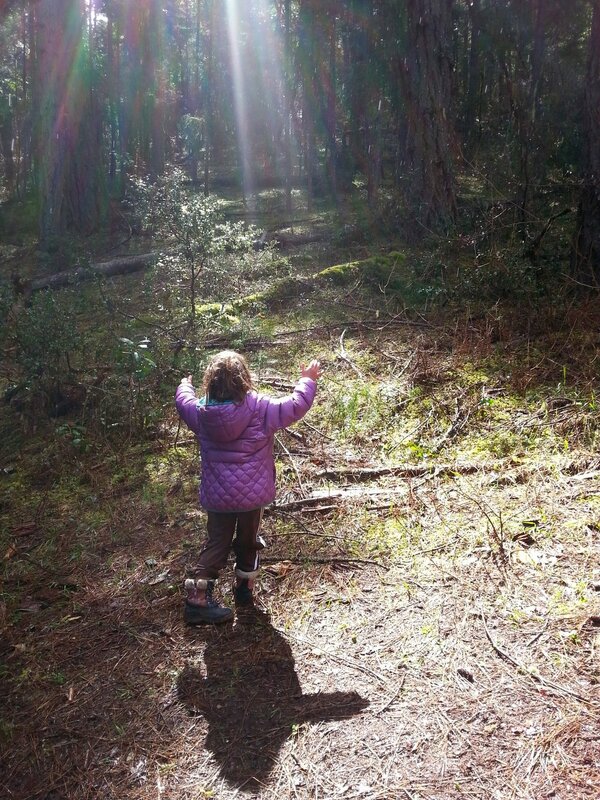 I kept expecting some forest fairies to prance across our path, but we weren't so lucky. When we got down to the stream there was a couple of logs thrown across it and I said it can't possible be across there so we took a right up a STEEEEP hill. Once we got up to the top, nope, we looked over the ridge and there was our car. Do not take the right trail, it's a horse trail. Yah, we were kind of bummed on that but we turned around and went across the log bridge. It was such an awesome, SHORT hike. It was perfect for all of us; especially after hiking Grouse Loop. It was well shaded, cool and not strenuous at all. There were a few bridge crossings, with a couple of them being just logs thrown over the water and Olivia mastered them like a boss. She started getting upset because she thought we would find Bigfoot, and of course, once we got there Bigfoot was nowhere to be seen, but it was still fun to see what the old miner, Perry Lovell built to catch him. The best description I found for the history of the trap is here. We had a really great day and checked off another of our southern Oregon bucket list. My dad, Gary and I have lived here for over 20 years and we had never been there so it was fun to finally get out there together. The kids also enjoyed themselves immensely. Who knows, next time we go maybe we will get lucky and see Bigfoot! If you want to go, head to Applegate Lake and pass Hart-Tish Park. Right before you cross the bridge is Collings Mountain Trail. If you can, park there on the right or left side. Don't forget! once you get down the hill you must stay to the left and cross the creek. It is only 3/4 of a mile in with no real incline. Where should we go next? Give us some ideasâ€¦everytime we check something off we add 2 or 3 more things, and we love it. That's what is so great about southern Oregon; the possiblities are endless!